Utricularia purpurea (purple-flowered bladderwort) went undiscovered in Minnesota until 1992, which in itself is a good indication of its rarity in the state. Based on this indication, and with the hope that additional plants would be found once surveys had been conducted, it was designated special concern in 1996. In following years, targeted botanical surveys of over 2,000 lakes statewide found this species in only 12 lakes (Laurentian Mixed Forest Province). This is a very low frequency of occurrence and ranks U. purpurea as one of the rarest aquatic plant species in Minnesota. While the causes of its rarity are unknown, it is likely related to the particular biology of the species and its ability (or inability) to find and successfully compete in appropriate habitat. Regardless of cause, a key factor in the preservation of this species is maintaining high water quality. As more and more Minnesota lakes are officially listed as "impaired", and as money for cleaning up these "impaired” lakes is slow to materialize, the future of this species in Minnesota looks less and less assured. For these reasons, the status of U. purpurea was upgraded to endangered in 2013. 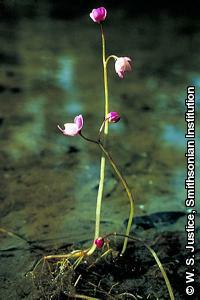 Utricularia purpurea is a submersed aquatic plant. It is rootless and free-floating. The stems can be up to 1 m (3.3 ft.) long, and they produce leaves in whorls of 5-7. The leaves are branched into numerous slender segments and appear lacy. The flowers are purple or lavender, about 1 cm (0.4 in.) long, and are on stalks that emerge several inches above the water. The bladders are small and roughly spherical and are attached at the tips of the leaf segments. Utricularia purpurea is a submerged aquatic plant found in small and medium size lakes, usually in 0.6-0.9 m (2-3 ft.) of water, adjacent to a boggy shoreline. Curiously, in two lakes it has been found growing along firm banked shorelines. The substrate is usually fine-textured sediments, though U. purpurea does not root in the substrate - it floats freely, just below the water surface. Water chemistry data are available for seven of the 12 Minnesota lakes where U. purpurea has been found. The total alkalinity of these lakes ranges from 5-59 ppm, with a mean value of 22 ppm. The pH ranges from 6.8-8.9 for a mean of 7.5. There are about 200 species of Utricularia (bladderworts) in the world, ranging in size from a few inches to several feet long (Taylor 1989). Common to all species, are the tiny bladders attached to the leaves that trap and digest very tiny animals (Marmottant 2011; video). Although the bladders of U. purpurea are fully capable of trapping small aquatic invertebrates and digesting them, it is not clear whether this carnivorous capability is critical to the normal life cycle of this species (Richards 2001). Utricularia purpurea reproduces by seed and by a vegetative reproductive structure called a "winter bud", which normally forms at the tip of each branch. Although the stems, branches, and leaves die and decompose at the end of each summer, the winter buds survive through winter and grow into full-functioning plants the next summer. With 40% of Minnesota's lakes considered "impaired" by pollution of one sort or another, the survival of rare and sensitive aquatic species is a matter of general concern. Much of the pollution comes from distant sources and arrives by wind, rain, or streams. Other sources include nearby agricultural and industrial activities. A major and growing source of pollution is inappropriate lakeshore development. Pollution often takes the form of nutrient enrichment, increased sedimentation, and the establishment of invasive species, all of which can be considered direct threats to this species. Utricularia purpurea has been shown to be especially sensitive to elevated levels of phosphorus (Richardson et al. 2007). Although invasive species have the potential to displace U. purpurea and negatively alter its habitat, caution must be used when controlling invasive plants, since the effects of commonly used aquatic herbicides on U. purpurea have not been studied. Many resources and tools regarding shoreland management, including lakescaping and shoreland restoration are available for landowners and land managers to help maintain or improve water quality, and any opportunity to incorporate these concepts would benefit U. purpurea as well as many other aquatic species. The best time to search for U. purpurea is when it is in flower, from mid-July to September. Fassett, N. C. 1957. A manual of aquatic plants. University of Wisconsin Press, Madison, Wisconsin. 405 pp. Marmottant, P. 2011. The ultra-fast trap of an aquatic carnivorous plant. YouTube [web application]. <https://www.youtube.com/watch?v=Zb_SLZFsMyQ&t=63s>. Accessed 08 February 2017. Myhre, K. M. 1992. Results of a rare plant search in Cass County. Minnesota County Biological Survey, Minnesota Department of Natural Resources, St. Paul, Minnesota. 6 pp. Richards, J. H. 2001. Bladder function in Utricularia purpurea (Lentibulariaceae): Is carnivory important? American Journal of Botany 88(1):170-176. Richardson, C. J., R. S. King, S. S. Qian, P. Vaithiyanathan, R. G. Qualls, and C. A. Stow. 2007. Estimating ecological thresholds for phosphorus in the Everglades. Environmental Science & Technology 41(23):8084-8091. Taylor, P. 1989. The genus Utricularia: a taxonomic monograph. Kew Bulletin Additional Series XIV. Royal Botanic Gardens, Kew, London. 724 pp.